Add an easy $1,000+ and lots of fun to your scramble event! This page describes how you can raise a lot of money at your next outing. We provide a "Template Tool Kit" at the bottom of this page that includes a media press release, sponsor invitation, promo-emails to prospective players, hand-outs, silent auction wording...everything you need to make it easy for you to raise a lot of money, anticipation, and fun at your next golf outing with the World's Longest Driver Contest. Just as importantly, it can attract new golfers and a new corporate sponsors. we will pay $150 of your cost. The information on this page presumes you have already read about the telescopic World's Longest & Largest Driver. If you haven't already reviewed that information, please do so before reading the rest of this page. It includes important information about the driver and how it can hit the ball so far. This huge driver is designed as an exhibition club for charity golf outings where EVERYONE gets a chance to hit it. You can use it to raise money with any or all of the following strategies which are discussed in more detail in the next section below. 1) An easy $1,000 or more from a sponsor for the contest hole. 2) Practice shots at the driving range for a donation. 3) Foursome donations at the contest hole where everyone gets a chance to swing it. 4) By offering a BIG STIK in your auction. The BIG STIK is compelling. Everyone wants a turn. It generates a lot of excitement because of the big drives and loud noise, along with some laughter because some golfers can miss-hit the first swing or two, or even swing and miss completely as you will see in the video! But when they connect, the concussion echoes around the golf course and the shot can literally fly out of sight! You can do one of these ideas, all of them, or any combination or alternate idea you have. We offer these as proven winners. As with all outings, sponsorships usually provide the most revenue. So we encourage you to get a "World's Longest Driver Contest Sponsor" that will cover the cost of the drivers, and a whole lot more. Of course, even if you don't get a sponsor, the driver will still easily pay for itself and a lot more from the contest donations, practice shots, and auction described next. But getting a sponsor for a unique contest like this is very easy, so why not! Outing organizers are familiar with getting local companies to sponsor lunch, dinner, hole-in-one contests, buy-an-eagle holes, etc. These sponsorships vary in cost from $500 up to $5,000 or more at the more expensive outings. Sponsorships are appealing to companies because they generate more exposure than a simple donation. And they are good for the outing because you can get more than the cost of the lunch, hole insurance, or in this case, far more than the cost of the BIG STIK's. "The World's Longest & Largest Driver" is new to the golf world. So sponsoring it is a unique opportunity that hasn't been available before. It will be exciting, and has the benefit of providing extended exposure for the sponsor with a YouTube video of the swings (discussed below). As a bonus, the uniqueness of this sponsorship makes it possible for you to reach out to a new company that hasn't been involved in past Outings. Car dealerships, insurance agencies, realtors, contractors, and any other company that advertises in your city will make a great sponsor. Just notice the billboards, newspaper, and media advertisements for a couple of days and you will see dozens of companies that will jump at the chance to sponsor this unique contest. We suggest you ask for at least $1,000 which covers the driver cost and yields a lot of additional revenue. You can keep the driver for future outings, so you will earn even more each year you do the contest. We recommend that you invite your sponsor to bring a foursome, especially if you are using this to attract a new sponsor because there will be other ways to raise money from the players (mulligans, super tickets, drawings, etc.). You can adjust the sponsorship amount if needed to cover your player costs. We provide a template page you can print for prospective sponsors in the "Tool Box" below. The best way to approach a prospective sponsor is to carry a 5-Foot Big Stik in with you. Their first impression will be amazement...and the reaction of everyone else in the office will convince them that sponsoring the contest will be a great way to promote their company. In other words, let the BIG STIK do the talking! It is simply impossible to duplicate those reactions with a phone call, brochure, or email, even if it includes a video. If they don't make an immediate decision, you can leave the printed page with them, but we don't recommend you mail it to them as their first or only impression. Their first impression needs to be seeing the actual club and watching the reactions of everyone around. Of course, inviting them to the driving range where they can hit it is even better, but usually not necessary. So be sure to get your BIG STIK before you approach a prospective sponsor. We will be conducting “The World’s Longest and Largest Driver Contest” this year where everyone will be able to hit a 5-Foot long driver with a head that is nearly double the size of a conventional driver. You can read about it on the attached brochure. If you are interested in sponsoring this contest hole, please let us know right away. It is a $1,000 sponsorship. If the driving range is front-and-center where everyone is located, it can be a lot of fun to let people take practice swings. Crowds will gather, people will gasp at the monster shots, others will laugh at misses. An enthusiastic volunteer can have a lot of fun inviting people to "step right up" and "take your chances with the World's Longest Driver" and other fun challenges. Emailing the promo-invitation we provide in the "Tool Kit" below will motivate them to come early and take some practice swings. This is the main attraction where everyone gets to hit the club in exchange for a donation at the contest hole. Most outings get 100% participation, especially because of the way the hole is set up. We have that all prepared for you to email or hand to the course manager. 1) The course manager will select one of the holes for the contest, preferably a Par 5, but a Par 4 will work too. It should be a hole with as wide as possible landing area, with no houses, roads, cars, or close parallel fairways nearby...since some of the shots will be...shall we say, WIDE! 2) A flag or other marker is placed 300 yards from the tee in the middle of the fairway, or 150 yards from the green, whichever is closer to the green. 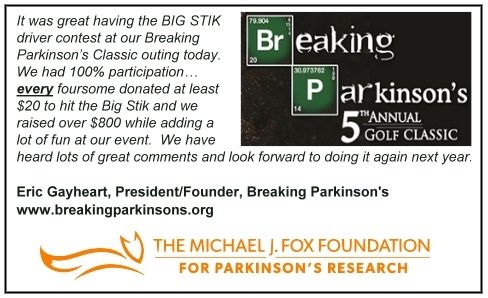 3) For a recommended donation of $20 per foursome, all 4 players get to hit the BIG STIK. If no one hits the ball past the marker, everyone still gets to hit the next shot from there and the drive doesn't count as a stroke! In other words, they will be hitting their first stroke to the green giving them a great opportunity for a double eagle putt if it's a Par 5 hole, or an eagle putt if a Par 4. 4) Optional: Most courses will gladly place 4 holes (or at least more than 1) on the green. If the foursome participates in the contest with a donation, they can putt to their choice of any of the holes. If they don't do the contest, they have to putt to the most difficult of the locations…which will be specified by the volunteer before they tee off...usually the hole that is tucked into a back corner. Note: We currently only have these giant heads in right handed versions. We can make a 5-Foot left handed driver using a 460cc head, or if you only get the right handed version, so anyone in the foursome is left-handed, they can designate a right handed teammate to hit for them, or they can swing their own club. Even foursomes where everyone is left handed will still participate with a donation because the drive doesn't count as a stroke, and they can putt to any of the 4 holes on the green...which almost guarantees a double-eagle or eagle putt. That's how we will get 100% participation. How much should you suggest for a foursome donation? It depends on your outing. If your outing entrance fee is $75 to $150, we suggest you ask for a, "$20 to $100 donation per foursome." The reason we suggest a range is to make the lower number seem easy. Most will donate the lower amount in the range. If your outing entrance fee is $175 to $250, you can ask for $50 to $100. If your entrance fee is $300 to $500, you can ask for $100. In other words, it depends on your outing and the financial ability of the participants...usually related to the entrance fee. 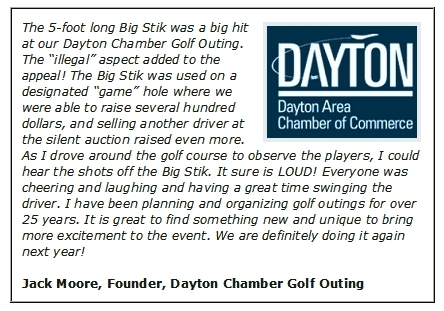 Some outings get 2 BIG STIK Drivers...1 for the hitting contest and driving range practice, and 1 to auction off. Your sponsorship covers the cost, so it is free additional revenue for you. This can be a live auction, or a silent auction. You can set the starting bid at a little over your cost and a Buy-It-Now for $499 which is our retail price. The first person can take it home with them, and you can order as many drivers as you need after the event. The Buy-It-Now option is important because some players won't be able to stay for the whole event, plus it allows for multiple buyers. Who would want to buy a driver like this? It is usually a person who displays it in his or her office as a conversation-starter. Its impressive size and length just can't be ignored. If you place your order in April , we will pay $150 of your cost. The manufacturer's suggested retail price (MSRP) of these unique drivers is $499. We are offering them to our regular customers this month for $399. If you are a non-profit organization, we will pay $150 of the cost lowering your share to $249 if you order this month. he or she is willing to provide it to you in exchange for a foursome at your event. In other words, you can raise $1,000 or $2,000 without needing to purchase the club. Click here to see our lifetime guarantee. Part of the unique appeal of this giant driver is seeing the great shots, but also the initial wild shots or swings-and-misses...sometimes by low-handicap golfers. Other golfers watching will hoot and howl, making it all the more fun. When great contact is made, the most common word you will hear is "WOW!" Designating someone to video the swings with their smart phone or other video camera will give you some great footage to show during dinner at the end of the event. You can also post it on YouTube and get some viral exposure for your charity, outing, and sponsor. Just edit it down to a minute or two of the best and worst swings. We'll promote it too! The media is always looking for unique stories. The "World's Longest Driver with the World's Largest Head" definitely qualifies. They might do just a blurb during their news, or they might come out and film the shots. Either way, it gives your organization a unique reason for a press release and media invitation. Suggested wording is in the Tool Box below. We provide templates for pre-event mail-outs, press releases, auction description, and everything else you will need to maximize your income from the "World's Longest Driver Contest". These materials are linked in the "Tool Box" below. We recommend starting the process of getting your driver(s) and lining up a sponsor as much in advance as possible. You will want to have your sponsor confirmed early enough before the event in order to get the most out of promoting the "World's Longest Driver Contest" to prospective participants. You will be able to invite media attention with a press release, and use it to attract new players and foursomes, and invite them to come early to practice. So we encourage you to order your BIG STIK driver(s) as soon as possible. We hope we have geared up our production enough to keep up with the demand in a timely way. When we have answered all your questions and you are ready to order your BIG STIK's, please begin with an email or letter to sales@divnick.com that includes the elements described in the pricing section above. Please let us know when your event takes place. Click here to see a 1-page PDF summary of this webpage that you can send to your planning committee..
Click here to see a Checklist that will help you get the most out of your, "World's Longest Driver Contest". We will send Word Doc versions of these so you can easily adapt them for your needs. *If your contest hole is a Par 4, ask us for the Par 4 version of these documents (see #4c above). Divnick International Inc. invents and manufactures a variety of products that serve a diverse mix of industries. Its coin-spinning Spiral Wishing Wells have raised over $1 billion for charities around the world. Divnick's best-known golf club is the telescopic "Whole-In-One Telescopic Adjustable-Loft Club" that has a transmission in the head so it can be locked on over 34 loft positions. You can play the whole game with just one club. Divnick's telescopic clubs FLY FREE...no add-on baggage fees. You can read more about Divnick and its companies on www.divnick.com.